Vestal is an expression of musically inspired style for the fine-tuned individuals that know what they are about. Branded and marketed through musicians, friends, artists and athletes all immersed in musically driven cultures, Vestal produces the kind of watches and accessories that fuel personal progression. Merging music and fashionably functional goods is what inspiration has done for Vestal, and they want their muse to create a revolution in your world as well. Brought to life in 1997, Vestal can now be found in specialty shops across the globe. By harnessing constructive ingenuity and dedicating themselves to the use of only stellar materials, this company has carved out a niche for themselves that they have promised to call home for the future and beyond. When it comes to watches, Vestal is the master at creating the perfect models to support the kind of lifestyles of those who are drawn to them. Take the Brig Watch from Vestal’s Jordy Smith for example. This bad boy turns the tide on surfing as it takes the guesswork out of the whole process. It can track tides for over 200 beaches around the world for 20 years! It even has a custom training mode and is equipped with the newly patented OKTOLOCK system. Once you fasten it down, you never have to worry about losing the Brig, and a raised grip on the band’s underside decreases rubber contact on your skin while improving breath ability and flexibility. This would make a great addition to your surf gear. 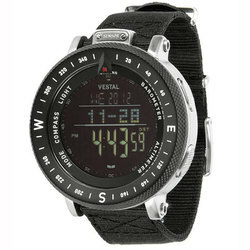 The use of high quality materials is impressively evident in the Vestal USS Observer Chrono Watch. Crafted from surgical grade stainless steel, it packs more durability than an actual naval warship. It can withstand a serious beating so that you never have to back down from a challenge. Then there is the likes of the Vestal Destroyer Plastic Watch. Never before has this much style been infused with so much lightweight performance. Injection molded and waterproof, this watch has some serious bark and bite. Vestal knows that looking good isn’t all that matters, so that is why they equip watches like this with tons of functionality. Not everyone is a math wizard or has a number-crunching genie hidden away in a portable lamp. That is why Vestal has unleashed the Datamat Watch. Yes, it is a watch and a calculator, so prepare to blow minds as you concoct some impressive figures with this surprisingly stylish calculator watch that is no longer just for nerds. See? This company has got your wrist needs covered on all fronts. Vestal invites you to open your ears and let the music you hear guide your groove. When you slap a watch from Vestal, you are making it known that you’ve got a style and vibe all your own that can’t be beat.